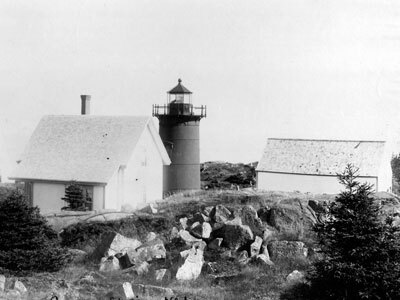 The original tower and keeper’s house at Little River Light Station, Cutler Harbor. 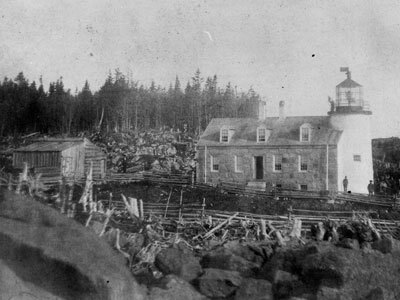 The first lighthouse at Little River was built in 1847. It was a stone tower attached to a granite keeper’s house. In 1876 the stone tower was torn down and replaced with a cast iron tower (brick lined), which still stands today. At one time, the lighthouse was painted red, with a black lantern. Today the lighthouse is painted white with a forest green lantern. The old granite keeper’s house was demolished in 1888 and replaced by a two-story wooden Victorian-style dwelling that still stands today. In 1881 the old boathouse was demolished and replaced with the present day boathouse. A vintage view of the present day tower and keeper’s house (the barn to the right is no longer standing). There were two different fog bell towers at Little River Lighthouse, though sadly, neither survives today. However, the original fog bell is on display in the Cutler Town Circle. 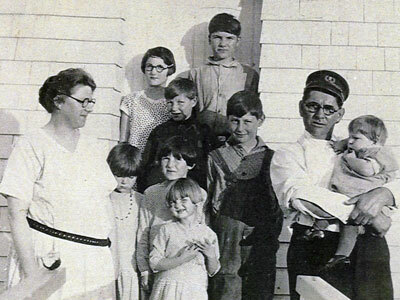 Keeper Willie Corbett and his family served at Little River Light Station from 1921 to 1939. 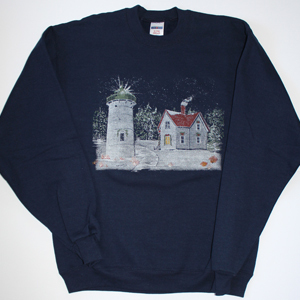 In 1939 the United States Lighthouse Service was abolished and its duties were merged into the United States Coast Guard. Willie W. Corbett, a veteran lighthouse keeper who was stationed at other Maine lighthouses, served as keeper at Little River from 1921 to 1939. Corbett had the distinction of being the last keeper from the United States Lighthouse Service to be stationed at Little River Lighthouse; officially ending the era of family lighthouse keeping in Cutler upon his retirement. 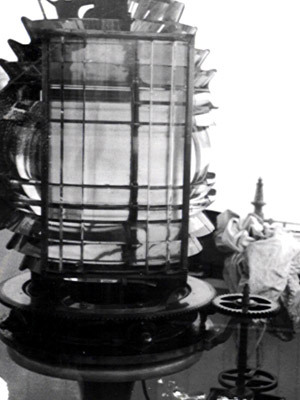 A view of the fifth order Fresnel lens that was in place at Little River for many years. 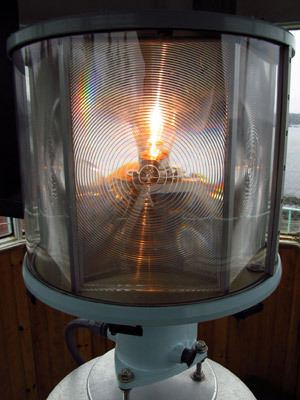 The lighthouse was originally equipped with a fifth order Fresnel lens as its optic. In 1975 the classical lens was removed and replaced by a modern optic atop a steel skeletal tower near where the present day foghorn and solar panels are now situated. The whereabouts of the Fresnel lens remains a mystery to this day. After the station was automated the Coast Guard left the island and the government attempted to maintain the station with caretakers, an arrangement they eventually discontinued. The historic light station structures were then boarded up and abandoned. In 1993 the government offered the lighthouse to the Town of Cutler, but they declined the opportunity to assume ownership of the island and the lighthouse. Over time the lighthouse and the island were also offered to the State of Maine, the National Park Service and U.S. Fish & Wildlife. All declined ownership saying the lighthouse would cost too much money to restore and maintain. A view of Little River Light Station prior to ALF stepping in to restore the historic structures. 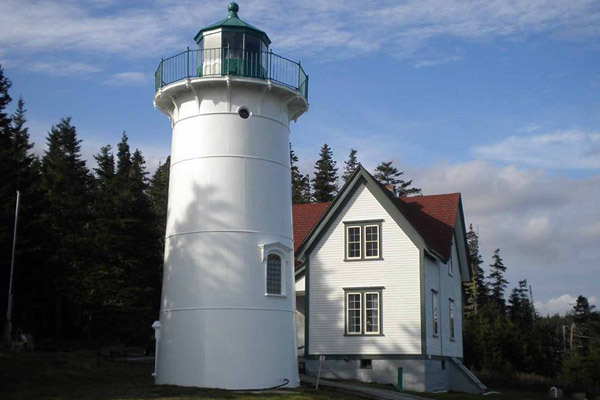 In June of 1998 the Maine Lights Program transferred over 30 of the state’s lighthouses from Coast Guard ownership to nonprofits, local municipalities and state and federal agencies. Although Little River Lighthouse was offered for adoption under the Maine Lights Program, again, no one stepped forward to take ownership of the light station. 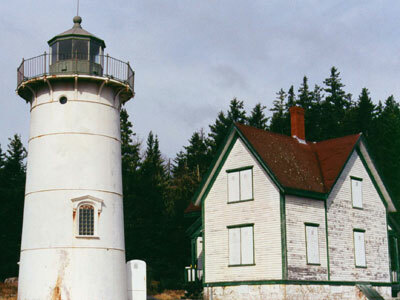 In the fall of 1998 Maine Historic Preservation declared the Little River Light Station as one of the “Ten Most Endangered Historic Properties” in the state. 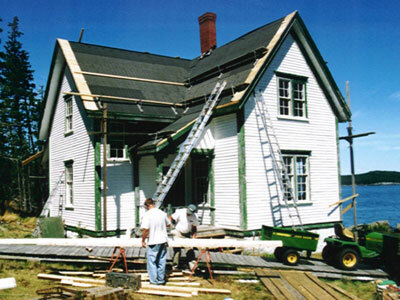 After obtaining a license from the Coast Guard, ALF worked hard to restore each of the light station’s historic structures, including the keeper’s house pictured here. By 2000, there was the real possibility that the lighthouse might eventually be declared excess property and sold to the highest bidder if a nonprofit caretaker could not be found. It was during this time that the nonprofit American Lighthouse Foundation (ALF) stepped forward and was granted an historic preservation license from the U.S. Coast Guard for the light station. During the same time period, the United States Congress, which realized the plight of America’s lighthouses, passed the National Historic Lighthouse Preservation Act of 2000. This Act provided equal opportunity for nonprofits to compete with government agencies in applying for ownership of lighthouses. Thanks to the restoration efforts of ALF, the Coast Guard agreed to reestablish a light back in Little River Lighthouse during 2001. In 2001, the American Lighthouse Foundation proceeded with the restoration of the light tower, boat ramp and wooden walkway on the island. 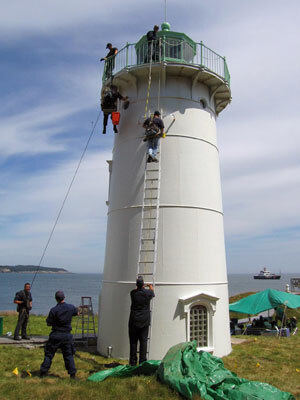 These achievements met the Coast Guard’s criteria for reestablishing a light in the historic lighthouse, which had been decommissioned in 1975. In October 2001, ALF held a relighting ceremony for Little River Lighthouse and dedicated the light tower as a “Beacon of Freedom to the World.” The relighting ceremony was designed to serve as a dual ceremony, honoring those who lost their lives in the terrorist attacks of September 11, 2001, as well as honoring the memory of the people of the United States Lighthouse Service and the United States Coast Guard who served at Little River Lighthouse. In October 2002 ownership of the 15-acre island and the light station structures (lighthouse, keeper’s house, oil house and boathouse) were transferred to the American Lighthouse Foundation. 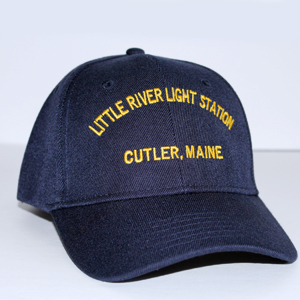 A proud moment…ALF obtained ownership of Little River Light Station from the Federal Government in 2002 through the NHLPA Program. 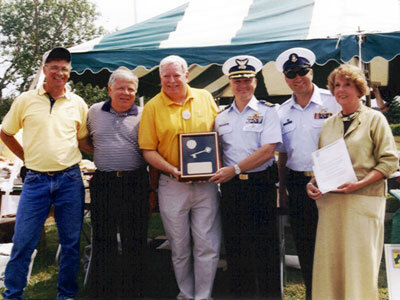 (L to R at the 2002 ceremony) Bill Collette, ALF Vice-President; P. Dan Smith, Special Assistant to the Director of the National Park Service; Tim Harrison, ALF President; Commander Hank Haynes, USCG Group Southwest Harbor; BMC Kenneth (Sam) Hill, USCG Aids to Navigation Team, Southwest Harbor and Saundra Robbins,General Services Administration, Boston, MA. Little River had the distinction of being the first lighthouse in New England, and the third lighthouse in the United States, to have its ownership transferred to a nonprofit group under the National Historic Lighthouse Preservation Act of 2000. The extensive application for ownership to the United States Department of the Interior was compiled on behalf of the organization by ALF President Timothy Harrison (1994-2007). The restoration project at Little River Light Station was the benefactor of grants from Lands’ End, the Cruise Line Charitable Foundation, New England Lighthouse Lovers, Patrick & Evelyn Finnegan Memorial Fund, Gannett Company, Maine Community Foundation and Machias Savings Bank; however, the bulk of the funds raised were obtained from individual contributions to the American Lighthouse Foundation. The Boy Scouts have contributed much in the way of time and efforts at Little River Light Station since 2006. 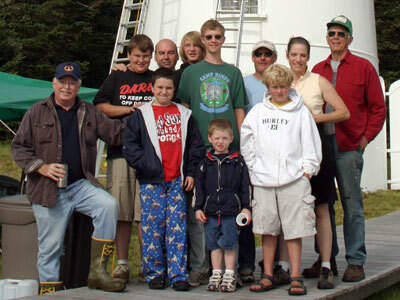 In August 2006 (and again in 2007) a Boy Scouts troop from southern Maine completed a wide variety of projects on the island, including work on trails, removing rocks from the lawn, cutting back brush and helping with general maintenance projects at the light station. In other noteworthy firsts, the Cutler United Methodist Church held the first-ever community worship service at the island on Sept. 3, 2006. In August 2007, Dave and Cheryl Corbett, being the high bidders for an overnight stay with a lobster dinner, became the first paying guests to spend the night on the island. 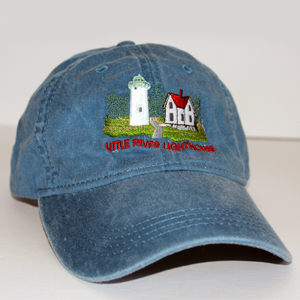 In August of 2007 the Friends of Little River Lighthouse was officially formed as a chapter of the American Lighthouse Foundation. The U.S. Coast Guard has volunteered their services at Little River on a few occasions. Since October 2001, many volunteers have helped immensely with the restoration at Little River Light Station, including Coast Guard personnel from USCGC ABBIE BURGESS and USCG ANT Southwest Harbor who volunteered on several occasions at the island. It would be impossible to list and thank everyone who gave of their time and talents from 2001 to the present day; however, we would be remiss if we didn’t recognize the major role that volunteer Hal Biering had on the restoration effort. Hal Biering, who along with his wife, Betty, came from Alabama to Maine and spent five summers working at the island on a near daily basis. A deep debt of gratitude is owed to Hal and to all those who have helped in ways both big and small to save this historic light station. Volunteer extraordinaire Hal Biering made a huge contribution to the restoration of Little River Light Station. In recent years, ALF’s Friends of Little River Lighthouse has been hosting open houses on the island, which include tours of the light station buildings and historical interpretation. An average of one thousand people visit the island on an annual basis, which is a wonderful number for such a remote, offshore site. Though the restoration of Little River Light Station was completed in 2008, the light tower, keeper’s house and other structures require ongoing care to ensure their preservation. To this end, the Friends of Little River Lighthouse carried out an important repainting project in 2014. Bert Preston Painting, who prepped, primed and repainted the cast iron lighthouse and wooden keeper’s house, did a fine job on the project, which was funded in large part by a grant from the Davis Family Foundation. Little River Lighthouse was prepped, primed and repainted during an important 2014 maintenance project. The project proved to be a team effort as the Benjamin Moore Paint Company graciously donated paint, Machias Glass repaired storm windows on the keeper’s house and Ellsworth Building Supply provided financial assistance. 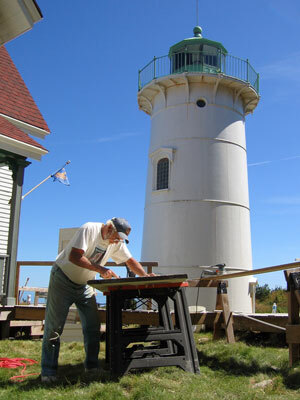 FLRL volunteer Terry Rowden, a former Coast Guard keeper at Little River, prepped, primed and repainted the lantern prior to the work performed by Bert Preston Painting. 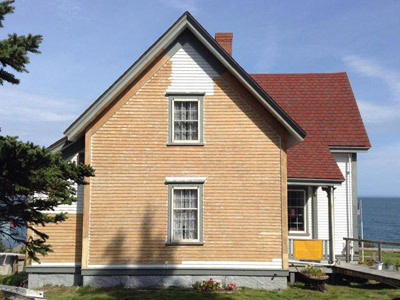 The keeper’s house was prepped, primed and repainted (and rotted wood repaired) during late 2014. 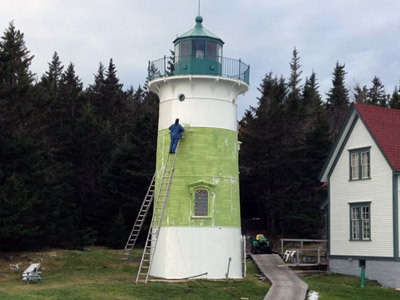 Volunteers also proved invaluable during the 2014 repainting project at Little River Light Station. Special thanks go out to Dave Corbett, Terry Rowden, Cynthia Rowden, Cheryl Corbett, Timothy Harrison, Kathleen Finnegan, Richard Knight and Judy Corbett for their efforts. The American Lighthouse Foundation and its local chapter, Friends of Little River Lighthouse, are committed to ensuring Little River Light Station is preserved for future generations and that this wonderful historic site and island can be enjoyed by the visitors through educational / public access programs and overnight stays. Thanks to the efforts of ALF’s Friends of Little River Lighthouse, the light station is gleaming once again following their late-2014 work projects at the island.